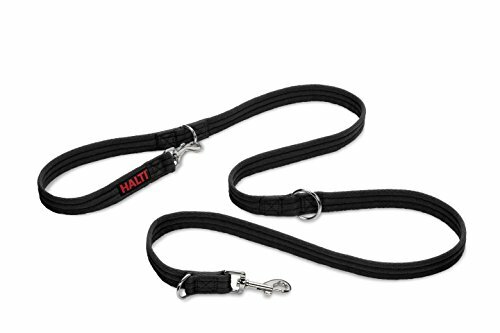 The Halti Training Lead featured in our Ruffwear Front Range Harness review. At first glance it may seem a simple product, it’s not. 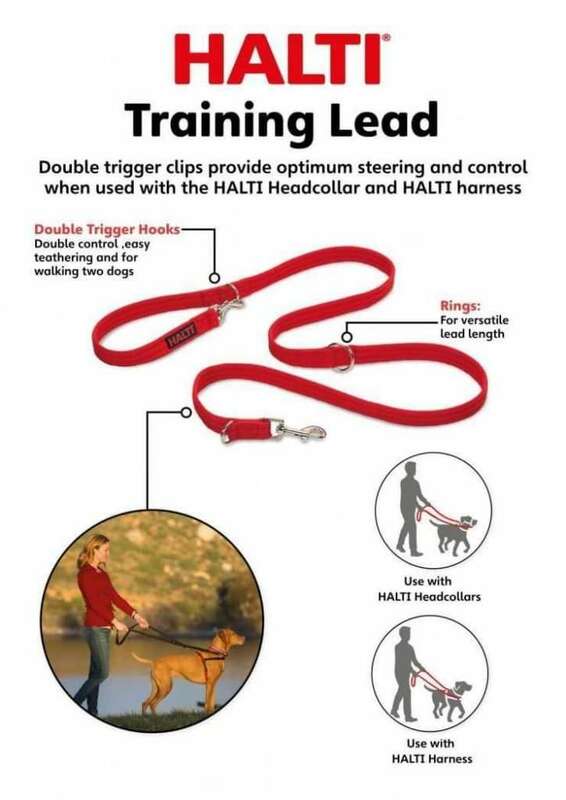 Halti Training Lead, designed by Dr. Roger Mugford, is by far the best readily available lead in many ways, and we use it to walk all our resident and guest dogs. Made from a soft padded material, it is incredibly comfortable to use, with very little risk of lead burns on your hands. Watch out for those rings though! There are two trigger hooks, one on each side of the lead, and three attachment rings. This means the lead can be used in 8 different ways. Don’t worry, this lead knows what it is, and isn’t trying to do any other job than be a lead. Primary function of the rings is to provide different lead lengths quickly. Short lead for heel training or those busy city walks, medium length for obedience training, or long length for distance and recall work (if you don’t have a giant dog like we do, you’ll need a longer line when working with an XXL dog). 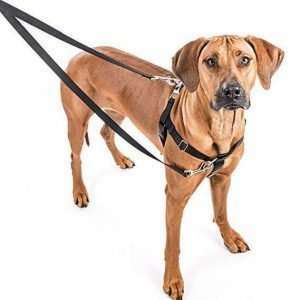 You can hook the lead around your waist, which is particularly useful when using a clicker and treats, or use the lead to tether your dog easily, just don’t do it for long periods of time. We are lucky that none of our resident dogs chew leads, but I don’t think it would survive for long if they did. 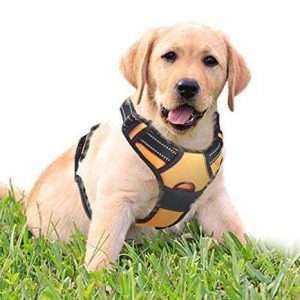 Other uses of this lead are in combination with a harness, as we most commonly do, particularly one with front and back attachments, and headcollars. With harnesses, you would attach one end to the back, and one end to the front of the harness for easy steering. 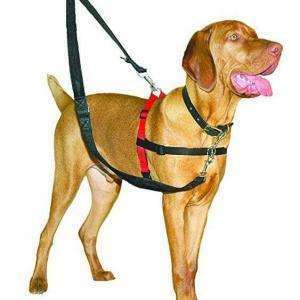 When it comes to headcollars, you can attach just one point, but we would not recommend that as you shouldn’t always need to steer; additionally, if your dog likes to wriggle out of things, headcollars will not hold them back, so attaching one end to a normal collar or a harness is highly recommended. It also works well with the Halti Headcollar. The Halti comes in two widths, and we tend to use narrower one for smaller dogs, and wider one for dogs above 15kg. The smaller one would simply not be comfortable enough for walking with bigger dogs, especially those who pull. Colours are a little limited: black, red, and black with red handles. You could bleach and dye and make it your own, or in our case, let a Great Dane drool all over them and then you can turn them whichever colour you want. And finally, every Halti Training Lead comes with a free training guide, so do make sure you give it a read. 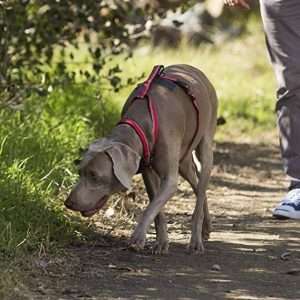 Dog Leads – What’s Best for Your Dog?